Stubbs the cat, who has been the mayor of the small town of Talkeetna, Alaska, for 16 years, was recently attacked and mauled by a large dog. The townspeople were dismayed and shocked by the incident. Stubbs is recovering, but is still in a lot of pain from his encounter. Stubbs earned his name right from birth, when his owner, Lauri Stec, the manager of the Nagley’s General Store, chose him from a box full of kittens and kept him as a pet. Lauri named the yellow tabby “Stubbs” because he was born with just the stub of a tail. From these humble beginnings, Stubbs’ political career took off like a skyrocket. When the town’s citizens were dissatisfied with the human candidates who were running for the office of the mayor, they decided to vote for Stubbs as a write-in candidate. The town’s feline mayor survived the attack, but was brutally mauled by the large as yet unidentified dog. 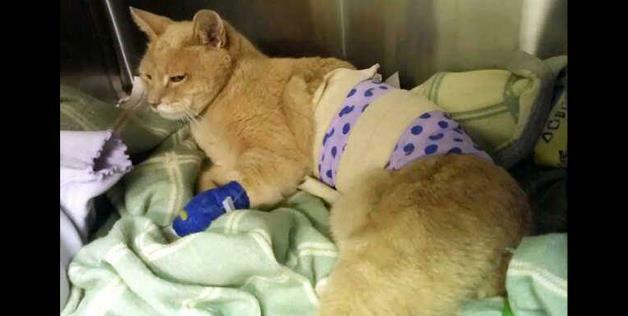 Stubbs wound up with his lung punctured, sternum fractured, and a gash on his side that was five inches long. The good news is the Alaskan mayor is recovering from his weekend mauling, and on Tuesday, he had his chest tube taken out. Finally, Stubbs was able to breath on his own, which he hadn’t been able to do since he was attacked. Talkeetna, a town of around 800 residents, is classified as a “historical district.” The job of being the town’s mayor is largely a symbolic one, though try telling that to Stubbs, who seems to take the position quite seriously, when he’s not busy chasing mice, getting petted, or taking…er…catnaps. There are no apparent leash laws in the town. Dogs roam wherever they please, but no canines have ever decided to assassinate the town’s mayor until this past Saturday night. The mayor’s medical bills, according to Stec, might amount to over $2,000. Stubbs has becomes an Internet sensation, as well as being the mayor of Talkeetna. If only there were more politicians around like him, perhaps Congress would get more work done. 3 Responses to "Stubbs the Cat Mayor of Alaskan Town Recovering After Being Mauled"
Get well soon, Stubbs. Got to get back into shape for scritches. I hope the Mayor gets well soon, he seeom like a wonderful fuzzy friend! Get well soon Mayor Stubbs!